The fight against cancer got another boost when the Moore Bahamas Foundation joined Ride for Hope as a Green Jersey sponsor, bringing additional energy and resources to the nation’s largest cancer initiatives’ fund-raiser. The October 26 bike ride featured riders of all ages, from tiny tots riding in bucket seats with their parents to 78 year-old riders. “We are honoured to support this incredible effort and important cause,” said Louis Bacon, founder of the Moore Bahamas Foundation. “With the generous support of the Moore Foundation and our other corporate sponsors, who completely underwrite the costs of staging the Ride for Hope, we were able to ensure that every dollar raised by our riders goes directly to supporting those fighting cancer in The Bahamas through education, screening, early detection, research and direct assistance,” said Stephen Holowesko, co-founder, Ride for Hope. Since its inception in 2006 in what seemed like an ambitious effort to get riders from around The Bahamas to converge in a staging area near Governor’s Harbour, Eleuthera to pedal up to 100 miles to raise money for the fight against cancer, Ride for Hope has grown into an annual rite. According to its other co-founder, Susan Holowesko Larson, two, 20-foot containers could hold all the bikes with room to spare in the early years. “Now,” she says, “with hundreds of bikes, we are filling up to four, 40-foot containers.” To date, some 1,500 cyclists have pedaled 45,000 miles to raise more than $1.45 million for cancer patients, facilities, for research and prevention. This year’s event held this past Saturday is so popular that requests for volunteer support were filled nearly a month in advance. More than 430 persons biked along the route with family members and friends cheering them along on the sidelines. This was the first time the event was held in October, cancer awareness month. In the past, it was held in April. 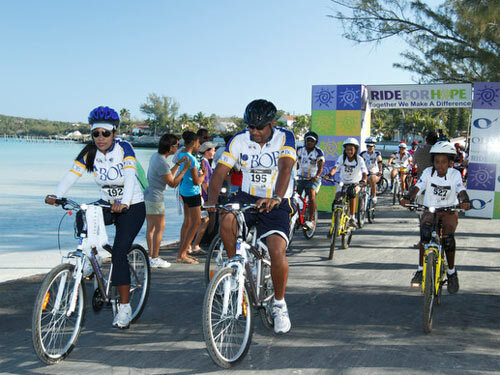 Funds raised by Ride for Hope are distributed through its foundation to the Bahamas Breast Cancer Initiative, Cancer Caring Centre, The Cancer Society of The Bahamas, Emory University, the Family Islands Mammogram Screening Program and the Ride for Hope Treatment Fund. Moore Bahamas Foundation (MBF), an affiliate of Mr. Bacon’s Moore Charitable Foundation seeks to promote environmental education in the diverse ecosystems of The Bahamas. While Ride for Hope is its most recent donation, the foundation has been funding important environmental and educational initiatives for almost two decades, many of those efforts helping to preserve the archipelago’s fragile environment. In 2013, MBF provided support to marine education programs building awareness about the importance of preserving precious marine and land resources. A Moore Bahamas Foundation grant enabled BREEF to add a Research and Environmental Education Coordinator, increasing that organisation’s capacity to involve more students in field trips and hands-on experiences with the marine environment. In June, Moore Bahamas initiated a Nassau Grouper workshop with The Guy Harvey Foundation, leading to strategies and solutions to contain or minimize the many threats this important fish faces in The Bahamas. Moore Bahamas Foundation has also supported the Lyford Cay Foundation Scholarship Program, YMCA Swim for Ocean Survival Program, and The Nature Conservancy, Bahamas. Caption: And they’re off — The Moore Bahamas Foundation joined Ride for Hope as a Green Jersey sponsor to help fund the cycling for a cause benefit. This year’s event October 26 in Eleuthera drew more than 400 hundred participants and for the first time was held during cancer awareness month. Past Rides, as in the above photo, were held in April.